DOVER AIR FORCE BASE, Del. (March 24, 2000) -- There are airmen on the Dover Air Force Base flight line just about every minute of every day of the year. They're there when the sun's up and it's 110 degrees in the shade. They're there in the middle of a pitch black winter night when the wind screams across two miles of ice cold runway over frozen fingertips clutching a torque wrench down into a loose BDU sleeve. The more than 700 troops of the 436th/512th Aircraft Generation Squadron are about as close to the mission as you can get without actually being loaded aboard one of Dover's 36 C-5 Galaxy Aircraft as a piece of cargo. These are the airmen who maintain the huge aircraft that represent our base, keeping them fit for flight and mission ready at all times. Airman 1st Class Daniel Maylone verifies all tools are in his issued toolbox , before leaving CTK. AGS troops start off their day like many remember technical school. Airman 1st Class Justin Pratt, 436th AGS, APG, also known as a crew chief, explains, "We start out each day with a roll call in formation." During formation, AGS troops are briefed by the Shift Supervisor on what types of problems the aircraft are having. Problems, also called discrepancies, can range from engine failures to inability to accept power from an external generator, to failed sensors. Discrepancies are listed by the aircraft's tail number, the identifying number printed on the C-5's signature "T-Tail." 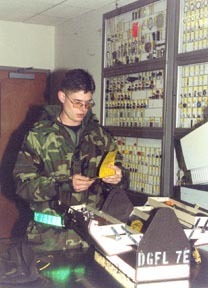 Discrepancies are quickly doled out to airmen qualified in unique specialties, and the troops are then dismissed to gather necessary equipment at CTK, or Consolidated Tool Kits, and are then free to head out to individual planes to make them flight capable and mission ready. After checking in at the aircraft, individual specialists go to work immediately. Airman 1st Class Rodney Mosser repairs a bus tie contactor, which distributes power to the aircraft. The first job of the day for Airman 1st Class Rodney Mosser, 436th AGS, ELEN, was to correct an aircraft electrical problem. A C-5 had been listed as "not accepting external power." According to Mosser, this meant the aircraft would not power up when plugged into a power generator outside the aircraft. "I knew what the problem was because it was listed in the aircraft's discrepancy forms," said Mosser. An aircraft's discrepancy forms stay with the aircraft at all times, and document the aircraft's recent maintenance history. Mosser works swing shift on the flightline. The diagnosis for the aircraft had been made by the day shift, but Mosser was ultimately tasked to repair the discrepancy. "The problem was with a bus tie contactor," explained Mosser, who has been with AGS for less than a year. "A bus tie contactor distributes power from either an internal or an external power source to the rest of the plane." Under the eye of supervisor Senior Airman Frank S. Gach, Mosser was able to correct the discrepancy in less than an hour. 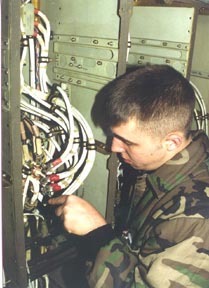 Sure of his work, Mosser went so far as to close up the access panel, and tidy up his workspace before the fix had been confirmed. When the external power generator was properly switched on, the inside of the aircraft lit up like a Christmas tree; the fix was good. Senior Airmen James Diliberto, 436th AGS, AFIN, stood nearly 50 feet above the runway on a steel tower known as a B-2 Stand. The wind was blowing 12 mph, and the wind chill was a nippy 18 degrees. 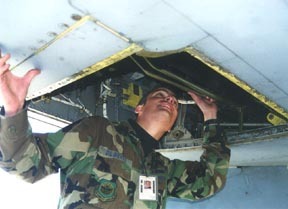 While removing a Signal Acquisition Remote from a panel on the underside of the C-5's behemoth wing, a shivering Diliberto explained the SAR is a device that gathers information from various electronic sensors on and around the jet engine and transmits that information to a maintenance computer in the cockpit. Senior Airman James Dilberto inspects an SAR under the wing of a C-5 Galaxy. Despite the frigid air, Diliberto didn't complain for a second about the cold weather. Instead, he made it perfectly clear that this was the job for him. "I love aircraft," said Diliberto, a Long Island, N.Y. native, with a tell-tale accent. "I love working on aircraft and I love the C-5 airframe." Performing maintenance on the aircraft is not Diliberto's only passion, though. He says he is currently working on his private pilot's license and one day hopes to fly military aircraft, not just maintain them. "That is my ultimate goal," said Diliberto. For now, though, he is happy maintaining the advanced flight control, and instrumentation equipment aboard the C-5. "I love what I do," said Diliberto. "If you love what you do, that's the most important thing." Similar sentiments were expressed by first termer Airman 1st Class Daniel Maylone, 436th AGS, JETS. "This is what I wanted to do before I got into the Air Force," said Maylone. "I love working on engines." Maylone explained his job is primarily to maintain the four sophisticated TF-39-1C Turbofan engines which provide thrust for the C-5, as well as to maintain the Auxiliary Power Units located at the rear of the aircraft. The APUs can provide electricity to the aircraft while on the ground, and also provide "bleed air" which aids in starting up the four jet engines. New to the career field, Maylone explained how he might go about solving an engine problem aboard a C-5. "The crew chief and a 7-level will ultimately decide what's wrong with an engine," explained Maylone. "For instance, an engine could have a bad margin, a bad turbine inlet temperature." Staff Sgt. 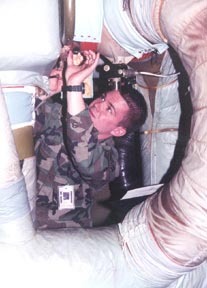 Robert J. Deline, 436th AGS, explained that by using the outside temperature, the atmospheric pressure, and a pre-printed table as a guideline, specialists can determine what the correct range is for the turbine inlet temperature. If the temperature slips outside that margin, it would be indicative of an engine problem. "We usually try to trim the engine, or give it a tune up," said Maylone. In addition to the five specialties, there is another specialty, "Crew Chief." Crew chiefs perform general care on the plane, to include handling fueling, oil, and changing light bulbs. The most important part of being a crew chief, according to Staff Sgt. John Ryan, 436th AGS C-5 Crew Chief, is coordinating repair work on the plane. Airman 1st Class Nicholas S. Bedell tightens the clamp on the flight station temperature control on board a C-5. "We coordinate all the maintenance aboard the plane," said Ryan. "We make the maintenance run smoother and safer." "We may have a specialist working the hydraulics system, servicing hydraulic fluid, oil and preparing the aircraft for flight. That specialist may need to raise or lower a flap, " said Ryan. "At the same time, another specialist aboard the aircraft may be in a position where it would be dangerous for that flap to move." Ryan explained that part of his job as crew chief is to make sure such conflicts never happen. In addition to ground based crew chiefs, there is also an elite corps of FCC or Flying Crew Chiefs who maintain aircraft on missions all over the world. While the aircraft is deployed, they perform crew chief duties and coordinate Maintenance Recovery Teams with HQ AMC if there's a problem far from home. These members of the AGS team stay on the road over 120 days a year. All other AGS specialists may deploy as well, to support presidential support missions and humanitarian relief missions. Additionally, AGS troops deploy as part of maintenance recovery teams. Like much of the Air Force, the 436th/512th AGS attempts to do more with less. Senior Master Sgt. Michael Morrow, 436th AGS Flightline Superintendent, known to many AGS flightline troops only by his radio handle, "ARCHER 2," explained. "These folks do an incredible job," said Morrow. "We worked with 1,200 people four years ago. Today, we do with only half of that. The aircraft can't get the same tender loving care they did back then, but the aircraft keep flying. Our airmen keep it working by working together." Through the efforts of Chief Master Sergeant Michael McClellan, 436th AGS Maintenance Superintendent, AGS was able to combine its troops into one, unified force that could work more efficiently. As little as 6 months ago, the squadron had been divided into a "red side" and a "blue side." "The change has paid tremendous dividends to us. We have a much better utilization of manpower now," said Morrow. Efficiency is all-important to AGS, because AGS is one part of the mission where the operations tempo never seems to die off. Whether it is humanitarian missions to Africa, airlift missions in support of the president, or wartime contingency in the far corners of the globe, if something is going on in the world where military airlift is needed, AGS will feel the pinch. "You pretty much can tell if it's going to be a busy day by watching the news," laughed Morrow. "These troops, I can't say enough about working with these young troops. It's like a big team. Everyone pitches in here," said Morrow. But that's not the best part of the job for Morrow. "When you get those engines started, and the plane you've been working on taxi's out onto the runway, that's job satisfaction. And all these guys know that."